In a quiet street, a few steps from the center and the sea, the Raffaella Hotel in Cervia offers many services, including: courtesy bike parking, WI-FI in the common areas, air-conditioned rooms, and the possibility to bring their friends 4-legged on vacation. 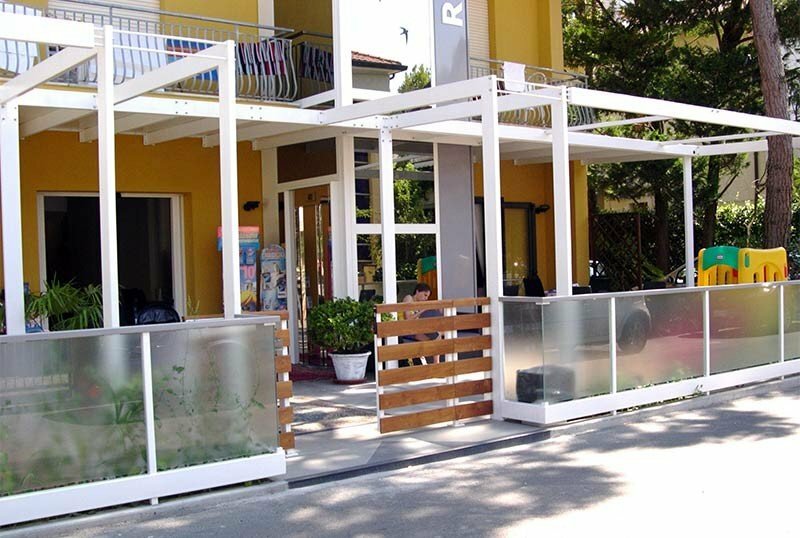 The hotel is located in a quiet and peaceful street, less than 5 minutes walk from the beach and the sea of Cervia. The city center and the station can be reached in a short walk. The rooms have a balcony, air conditioning with remote control, digital safe, ceiling fan, flat-screen TV with digital terrestrial, private bathroom with shower, complimentary toiletries and hairdryer. STANDARD AND STANDARD GARDEN : with balcony, terrace, garden, or window overlooking, TV 22 '', bathroom with shower, bidet, sink, hairdryer. SUPERIOR : with balcony or terrace, TV 26 '', mini fridge, bathroom with shower and chromotherapy, bidet, sink, hairdryer. BICAMERA - FAMILY ROOM : composed of two connecting rooms, one double and one with two beds. Independent entrance, balcony, TV 26 '', shared bathroom with shower, bidet, sink, hairdryer, window overlooking. In the room with two beds, own balcony, TV 26 '' and corner equipped with sink and minifridge. Garden with open-air porch, 5 bicycles available also with seat, bar, TV, tourist library, panoramic lift, massage service on request, laundry service for a fee. Theme nights are organized. PARKING: uncovered, 10 seats available. WI-FI : in the common areas and on the agreed beach. BREAKFAST : sweet and savory buffet with dishes prepared by the kitchen. LUNCH AND DINNER : three choice menus with grilled meat and fish, buffet of fresh vegetables and hot dishes. Confectionery of own production, water at meals in every accommodation package. In hotel: indoor and outdoor playground area, strollers. Upon request for a fee: baby sitter and pediatrician service. In the room : cot-bed of 125 cm, side rails. At meals : dishes and cutlery for the table, baby menu on request, dedicated kitchen area with bottle warmer, microwave, meat and vegetable broths, minestrina and past. On the beach : nursery with changing table, shower and tub and entertainment every day. The hotel has an agreement with the Mercuriali Bath and the Bagno Savini, which offer entertainment, games, volleyball, basketball, bocce court, table tennis, racquetball courts, free fly and Sky subscription. List prices are per person per day in Full Board for a minimum stay. of 3 days. Children accompanied by 2 adults. I book first and I'm quiet! Your holiday in the Romagna Riviera will be really special! Book by April 28 and receive a 10% discount on the total amount, for a minimum stay of 12 days in full board ... and then ..
many services and accessories dedicated to them! * Offers are not cumulative. Ask for the exact quote for the holiday with your family! "I book first and I'm quiet"
Contact us for more information and see all our other offers! * Offers can not be combined. Children are free up to 12 years! Book now and choose the best room at an extraordinary price.